Club Penguin Cheats by Mimo777 Club Penguin Cheats by Mimo777: Club Penguin Dance Contest Glitch! I think it means were all doomed. mmm maybe it´s a clue, and we need to find something, or we will find something next week. I seen this glitch quite a while ago on card jitsu fire. 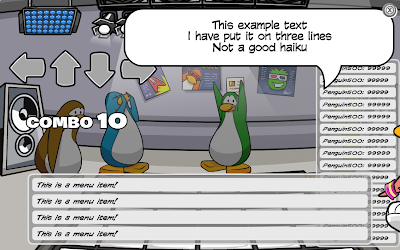 At the end of the card jitsu water video you can hear the igloo music. It will be the battle music. Please give me credit for this cheat. I think that its part of card jitsu water, they are just testing it and its accidently glitched onto other games? also, if you go on a game, somtimes it says file codes for buttons. Yep, I noticed that and took a picture. I also saw this glitch on card jitsu fire.... whats cp planning? Mimo, I told you that like two months ago and you never posted it! the same thing happens when you go to play puffle roundup, pizzatron 3000, jetpack adventure, hydro hopper, ice fishing, cart surfing, puffle rescue and aqua grapper,ect but it comes up with the hidden lake. It had that glitch in The fire dojo.. I found a cheat to get a cherry tree backround. Tell me if you want it. I think it means it's a clue to card jit su water. Another clue is that sometimes when I play games, it just shows me a frozen picture of the hidden lake. And in the hidden lake, there is a waterfall and I know it's a clue because the water dojo is in a different waterfall. hey mimo, i found out the glitch has been fixed! and i have another glitch when you first load into the town look in the top right corner and you see everybody's name! cool huh. please give full credit! Hey I noticed that too! When did u discover it? It showed up on my screen right before the new igloo catolog for this month came out!! I went to the Night Club and I just wanted to play the dance contest game to earn money for a jack-o-lantern igloo (or "loo")right before it went away.I took a screenshot of the glitch and me and my mom had no idea what it meant.